Call Cutta in a Box offers a one-on-one theater experience like no other that combines an international business industry with the opportunity to make a new friend. Imagine, you're sitting in your office and the phone rings; on the other line is a call center representative direct from India who engages you in stimulating conversation while objects around your office move by themselves to reveal a story. Not a paranormal experience, but not for the paranoid either, Call Cutta in a Box combines business with ultimate entertainment. This unique and entertaining theater production by Rimini Protokoll, is marketed as a performance piece, but is reminiscent of a business similar to renting a relative (link). Call Cutta in a Box has been offering its unique one-on-one entertainment experience during the months of January and February. Those looking for one of a kind entertainment can reserve a time for their custom 50 minute performance piece, which takes place at Rimini Protokoll's New York City office location. Customers enter the office and are escorted to their own personal office space, where the phone rings and an Indian call-center representative is on the other end of the line. As the conversation progresses, you may feel like you could be in any office in the world; but the experience won't take place in any office you're used to. 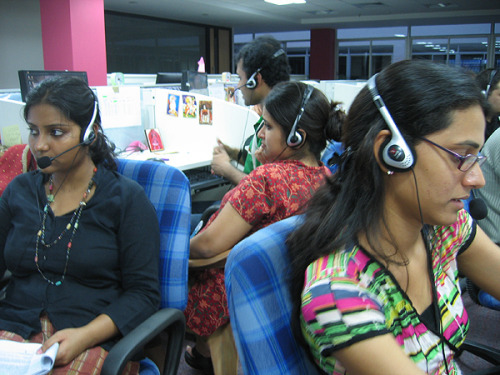 Naturally, the conversation between each person and their new Indian call center varies, since the story acted out revolves around each person's life, interest, background, and the things that they can mutually relate to. In most cases, however, the table moves, tea is automatically made, folders on computers open by themselves, and hidden keys are revealed in the room that open desk drawers that contain personal items related to the identity of the person on the other end of the line. Call Cutta in a Box brings the experience of having an imaginary friend to life. Your new friend may only exist at the other the end of the phone line, but they might as well be in the room with you. Could this unique stage production breed a successful business idea?